Spotted this earlier this week but it has no marks except the design. Seems to be the same shape as the one pictured in a Sapphire group on page 70 of Monk. Does anyone have any idea of the shape number or any other details please?. 140mm Dia X 135High including lid Pot is 100mm high. Val Monk Page 139 says that this range was released in Australia in 1980. Could it be a Margarine container perhaps, as they were very popular around that time? Now I have another without lid, sadly , but bigger 220mm Dia x 90 high cream body with all the chefs busily depicted around the sides . No number visible. will follow with photo tomorrow too dull today. As this pattern increases in size new elements are added. Like Jonno I have the larger size (2 of) but just in Pioneer glaze, no transfers. I got it into my head that mine were crockpot liners. 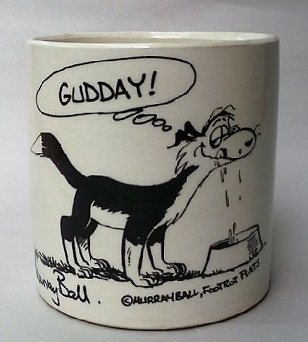 Just noted I have one in the shape and size of this, body AND lid in the lighter colour glaze, no transfer. Understamp reads "Crown Lynn Ovenproof Cookware New Zealand". No numbers sorry. Just noticed the lid on "Cordon" shown is a match for those on "Interlude" pattern (transfer) pots I have, same diameter but just 2 inches (50mm) from base to rim. 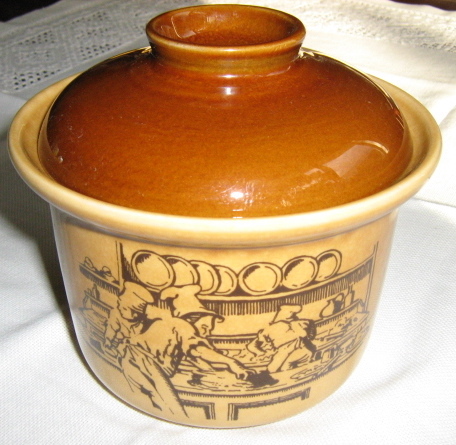 The Interlude pots are Pioneer glaze on lids, but light glaze on base, similar to the Cordon.